Straightening up I glanced at him wondering whether he meant why did I bother rescue the poppy pieces, or why did I bother wear one at all. I was tempted to say that I bothered because, whatever the rights and wrongs of it, young men like him had died fighting in wars. But my friends were waiting at the door and I didn’t want to get into a big discussion (and judging by the look of him it wouldn’t have been a fruitful discussion anyway). So I just smiled apologetically and left. Later of course I wished I had said something. Several years ago we spent a week in Sicily with some friends. Before setting off we happened to visit my elderly aunt who reminded me that her brother Basil (my uncle) had died during the invasion of Sicily in 1943 and was buried in Siracusa. ‘It would be so lovely if you could go and put some flowers on his grave,’ she said and we promised that we would if we could. Unfortunately when we arrived in Sicily we discovered that we were staying right at the other end of the island. ‘It’s too far,’ we said to each other. ‘It would take hours to drive all over there.’ And we tried to settle down to enjoy the holiday. But we felt guilty – after all my uncle had sacrificed his life and we wouldn’t sacrifice one day of our holiday. So we decided to go. We arrived at about 3 in the afternoon, bought two bunches of flowers and made our war to the cemetery. We were unprepared for the emotion that hit us. Lines and lines of small white headstones, each engraved with a young man’s name. We found my uncle’s grave quite easily, it was in the front row. Capt Basil Beazley, 29 years old. The glider assault had been a disaster. They were launched from too far out to sea and the winds were too strong. Most landed in the water, some even crashed into Mount Etna. Many, like my uncle died soon after landing attempting to defend positions with inadequate support. Military planning at its worst. Those young men must have known their chances were slim, but they did it anyway. Seven hours later we arrived back at the villa in the pitch dark. For some reason I wasn’t on the car insurance so my husband had had to drive the whole way. Did you have a good day?’ Our friends asked as we staggered in. We looked at each other. ‘Oh yes,’ I said. ‘We drove for seven hours, cried for twenty minutes and then drove seven hours back again.’ But it was worth it. We had picked up some pebbles and a bit of dry earth from the grave and when we gave these to my aunt a few weeks later she cried too. ‘I still miss him so much,’ she said. That’s why I rescued my poppy. I loved your article Helen. This year the remembrance services have seemed more poignant than usual because of the 75th anniversary of the Battle of Britain and the 70th of the end of WW11. 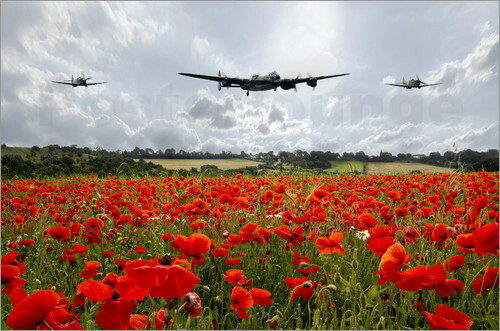 If it hadn’t been for all the brave men who gave their lives then, ours might be very different now. Thank you for this lovely piece, Helen. It reminded me of a visit my husband and I made some years ago to the north of France. We searched for days for the grave of my mother’s brother who was killed at the age of nineteen just before the end of the First World War. We found the grave, and shed our own tears, in a wind-swept military graveyard not far from Compiegne, flowers growing on the grave as on all the British graves, and at the bottom of the stone,hidden by grass, the names of my grandparents from Abertillery. No one else in the family has ever seen the grave. I have given the exact location to my cousins’ children who are still in Wales, and I hope they will one day go and see the grave of that young man from Abertillery who died so far from home. so sad isn’t it Helen to see row upon row of headstones. All young men heroes each and every one of them and so brave .